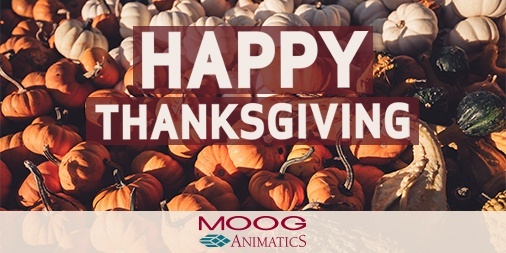 Moog Animatics will be closed for Thanksgiving on Thursday, November 22, 2018 and Friday, November 23, 2018. This is a reminder that Moog Animatics will be closed for Thanksgiving on Thursday, November 22, 2018 and Friday, November 23, 2018. We will reopen on Monday, November 26, 2018.